"Noka e tlatswa ke dinokana" is a Sesotho term meaning "A river swells from little streams." This is the motto of the Movement for Good, which is aimed at getting South Africans to help create the country they want to live in. If everyone in the country does something small that is positive, it will swell like a river to become one big positive wave. 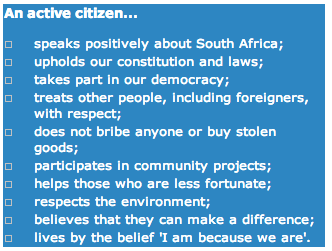 Making and keeping South Africa a wonderful country starts with YOU. To help you do this, a number of big organisations, like Government, the SABC, City Press, the International Marketing Council, and Heartlines have joined forces and are working together to involve ordinary South Africans to join the movement. The movement aims to connect and move people to become active citizens. This means they will help to make our country a place they will enjoy living in and which is free of xenophobia. Doing something good involves anything that is positive like helping those who are less fortunate; doing your bit to save energy; treating others with tolerance, dignity and respect; refusing to do crime, take bribes, or buy stolen goods; speaking out against violence and abuse; respecting the environment, and talking positively about South Africa. 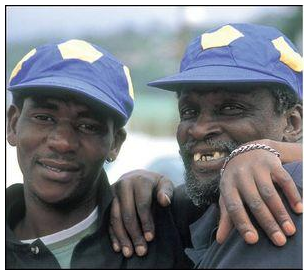 A research study found that South Africans were good people. 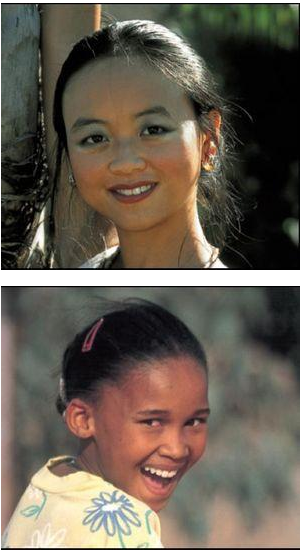 It showed that 93 per cent of South Africans give to social causes in the form of donations, time, and goods. It also showed that a total of R12 billion a year is donated by ordinary people for good causes all over the country. There are 100 000 non-governmental organisations that are working to make a difference and to do good in the country. People can get together and share their experiences using their cell phones or the Internet. Those using their cell phones will be forwarded weekly sms messages giving positive and practical information on how to take positive action. The network will also connect active citizens from the same areas who want to get involved in similar activities. To register on the For Good Network, visit www.forgood.co.za or sms 'good' to 32197.